Incident Summary | Fire assets were dispatched at 1527 hours PDT to a wildfire burning in the Upper Goose Lake recreation area is within the boundaries of the Columbia National Wildlife Refuge area. Size Up | It was reported in the initial stages as to the size by law enforcement but WA DNR’s CAD showed the fire had already reached 300 acres. There has been no official word as to what the size or even the cause was with various pressers via Social Media. Conditions | Firefighters are faced with the area’s landscapes peppered with rugged cliffs, canyons, lakes, and sagebrush grasslands. They are currently focusing on controlling the fire. Resources | Units T17 R28 S22 were dispatched along with additional resources BATT-804 DIV-802 E-842 E-863. Mutual aid from USFW, Grant and Adam Counties. Evacuations | Level 3 evacuations are still in force for the Rec area. All guests have left the area. Only fire personnel and law enforcement are still in the area. Fire Weather | Current weather report as of 1910 hours PDT is partly cloudy with temps of 89*F, winds at 11 mph and RH at 23%. Upper Goose Lake Rec area is located adjacent to the Western border of the Columbia National Wildlife Refuge and South of Potholes Reservoir. It consists of channeled scab land created by glacial floodwaters, and basalt outcroppings forming cliffs, mesas, box canyons and potholes. One major canyon is filled with water that has seeped from the Potholes Reservoir north of this unit. Two low rock dams were built-in the 1950’s to create Upper and Lower Goose lakes. The area has 130.4 acres of lake and is at an elevation of 865 feet. This area is popular for camping, fishing and other outdoor activities. The Goose Lakes area has a long history of range fires that have nearly burned up all the areas inside the Rec site, causing the area to turn into mostly grasslands. 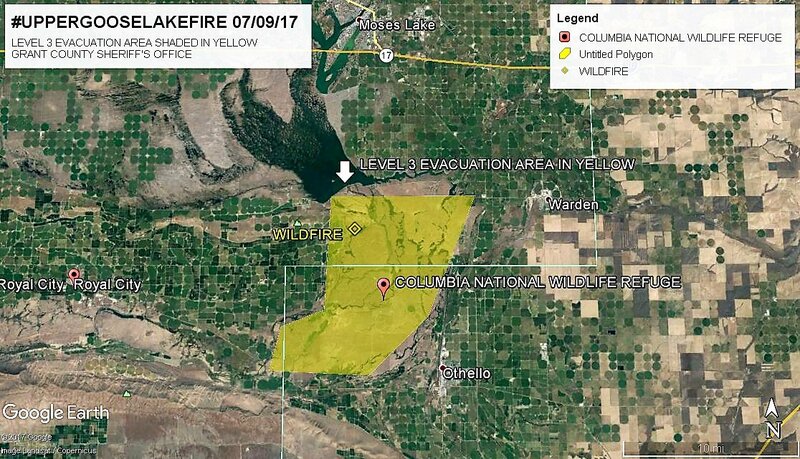 ← #UpperGooseLakeFire | Washington | Breaking!